The weather has been (literally) very hot and cold lately, and frankly, it's got me running in circles every morning trying to decide how to layer myself for the day. It's that lovely time of year again when it's 30 degrees in the morning while you're walking to class or on your way to work, but then by the time lunchtime rolls around, the sun is shining and you find yourself working up a sweat! You just can't win against the weather these days. Oh! And let's not forget the rain - it's literally rained every single Tuesday here for at least the past month. Moral of the story: the weather is unpredictable and a little bit insane. 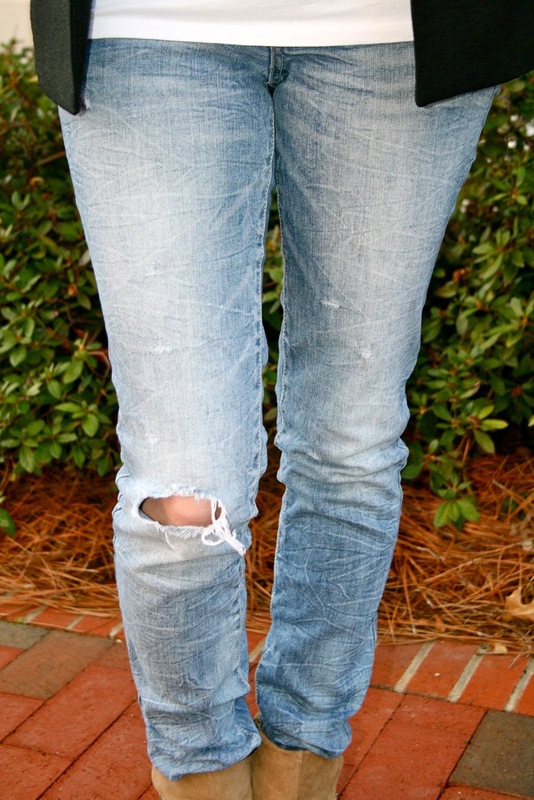 That's why jeans along with a few layers (i.e. my blazer and scarf) are always safe bets! By the end of the day you may just be down to a plain white tee and jeans, but hey, that's the ugliness of the weather and the beauty of layers! Lovely outfit <3 <3 You look great kat!! wow love your scarf! you look great! 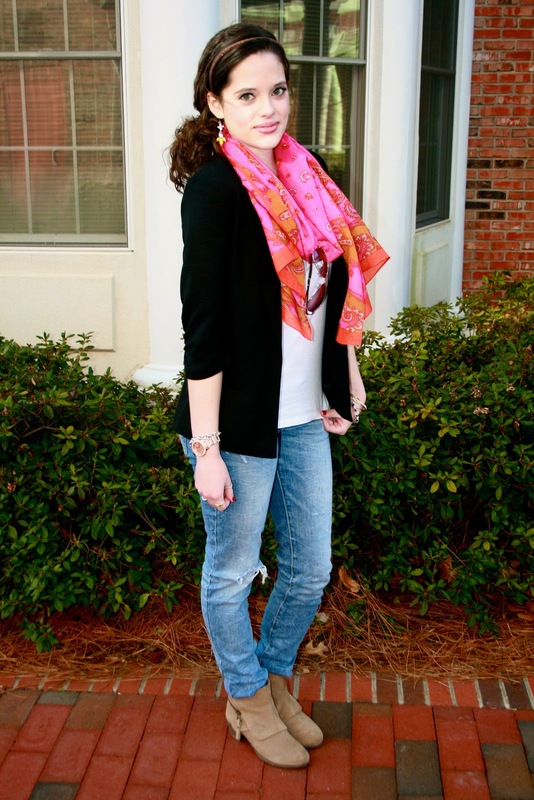 Love how you styled this scarf! Can't wait until the weather is somewhat normal! Casually simple, yet totally chic. Love this. And love that scarf! I think you really know how to perfectly layer for the unpredictable weather! 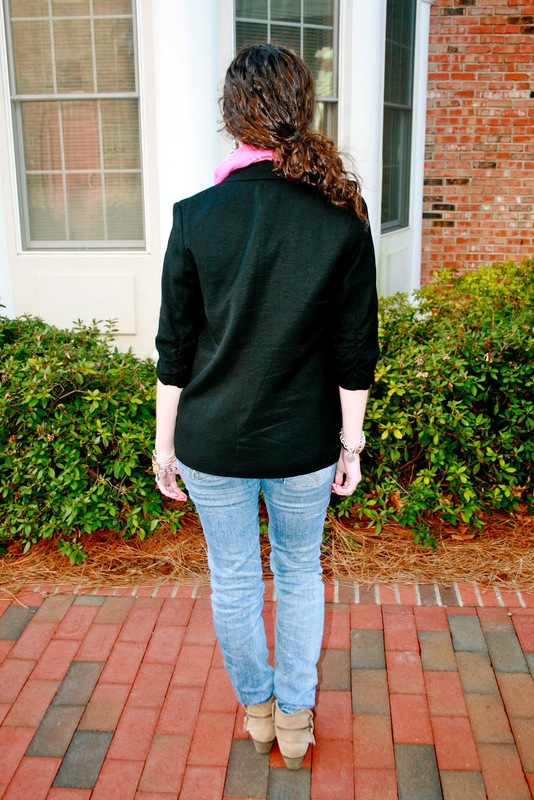 I adore your distressed jeans and blazer and your scarf is the best accessory (you really always have the most amazing accessories!) Have a wonderful week sweetie! Hi! You have a nice blog here! nice! I am following back! So cute! 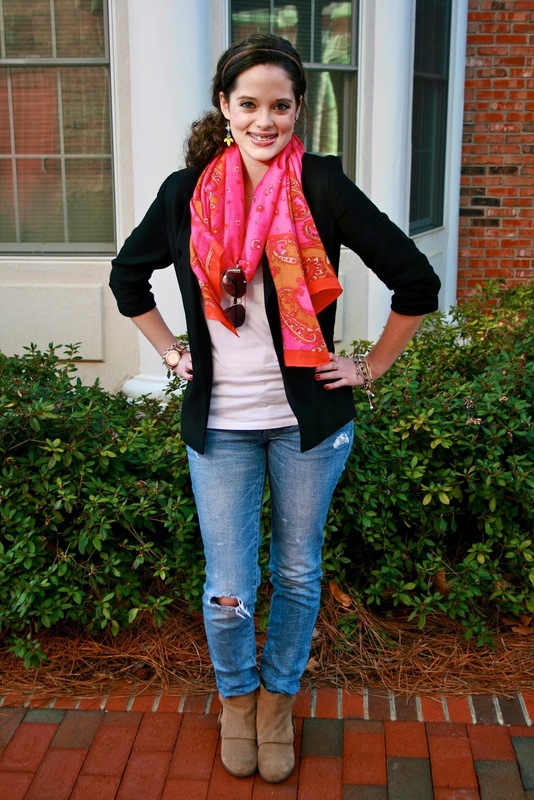 I love the bright scarf and those jeans look amazing on you! would be very happy if you can visit my blog and maybe follow me as well? great combo! 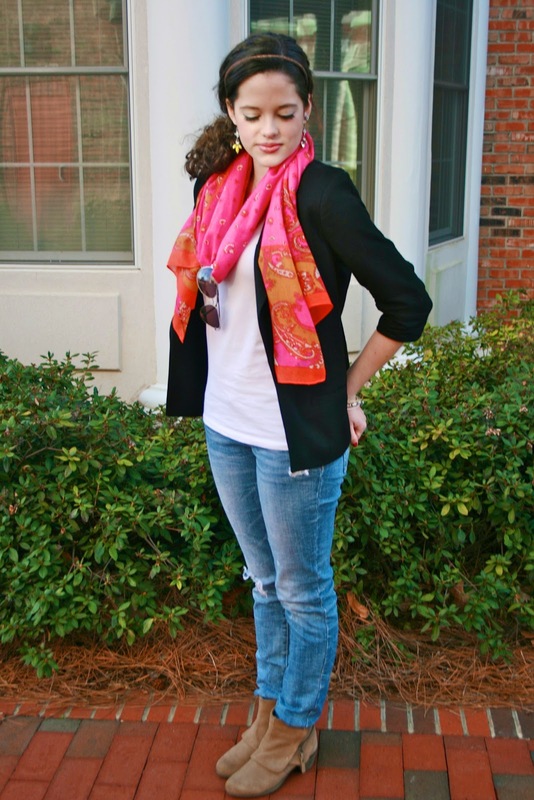 Your scarf brightens up the look! Love love love those shoes! I really need a pair of jeans like that too. Cute pics! 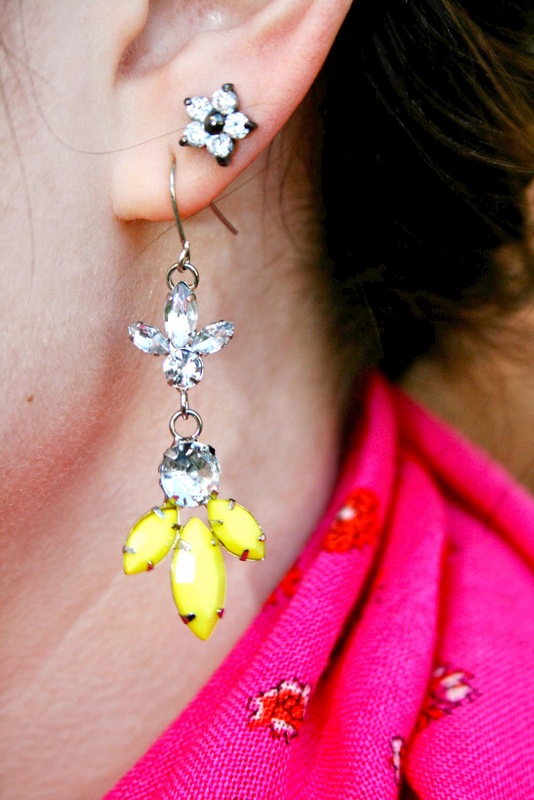 Love your jewelry, especially the earrings! great outfit! I really love your scarf! This is definitely something I would wear! I love it! 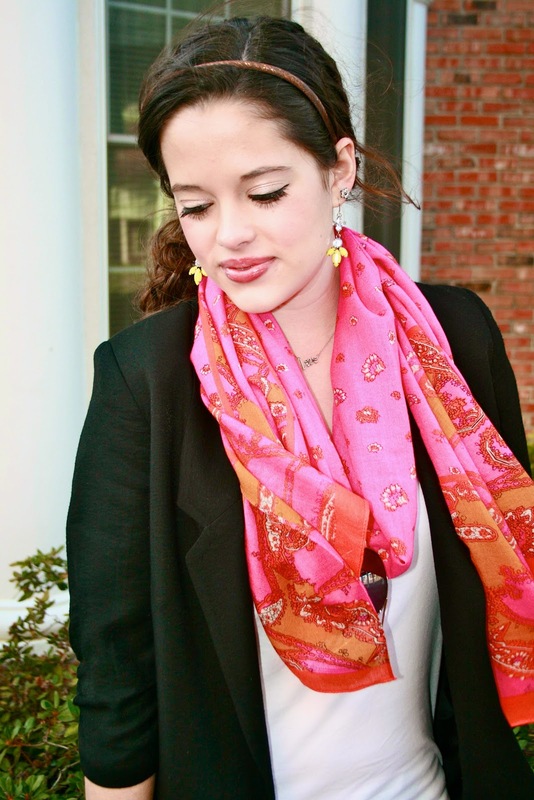 Love your foulard and your earrings! :) Perfect colors!! 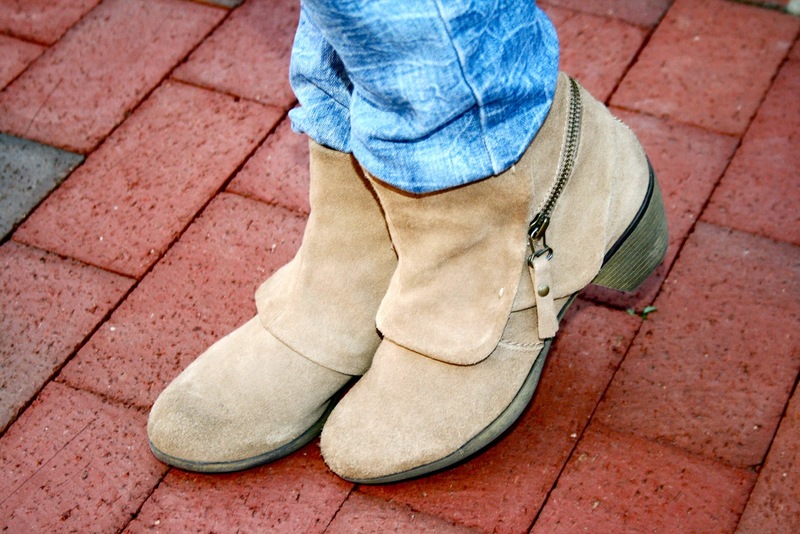 I like your jeans, boots and bracelets, Looks great! And yeah, It's tooo cold out here. Please let the spring come! Gorgeous pictures! You look stunning! Thank you for your sweet comment, I love the scarf. It is is bright and colourful. Have a lovely day. 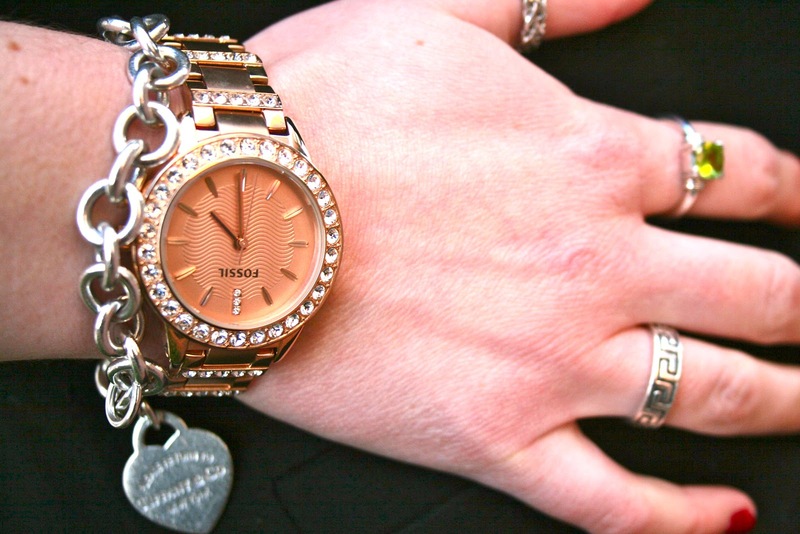 You have a great blog, maybe we could follow each other gfc and bloglovin? super pretty eyes! Would love it if we could follow one another? 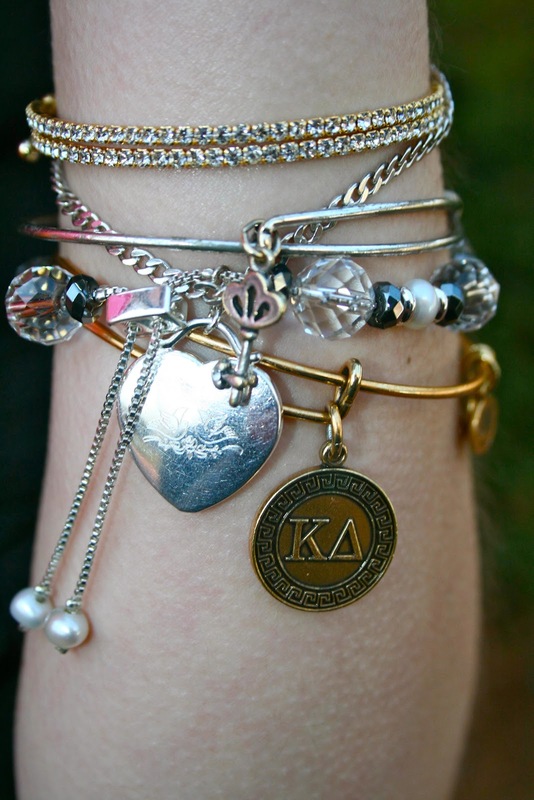 Hi Kathleen Your accessories are Oh so Pretty! Lovely outfit! 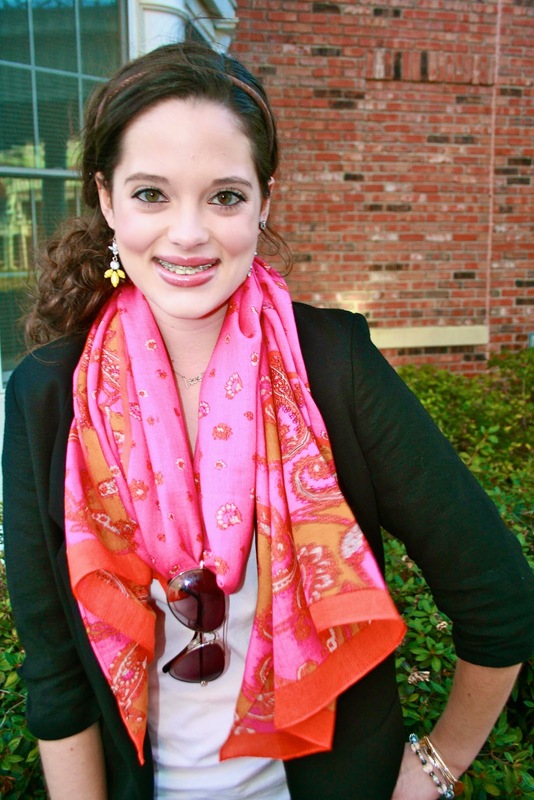 Love the bright colored scarf! Lovely blog! Great posts and beautiful pictures! I love this outfit. I love the blazer, Lauren Conrad and her line too! Thank you for commenting on my blog, come visit again soon. 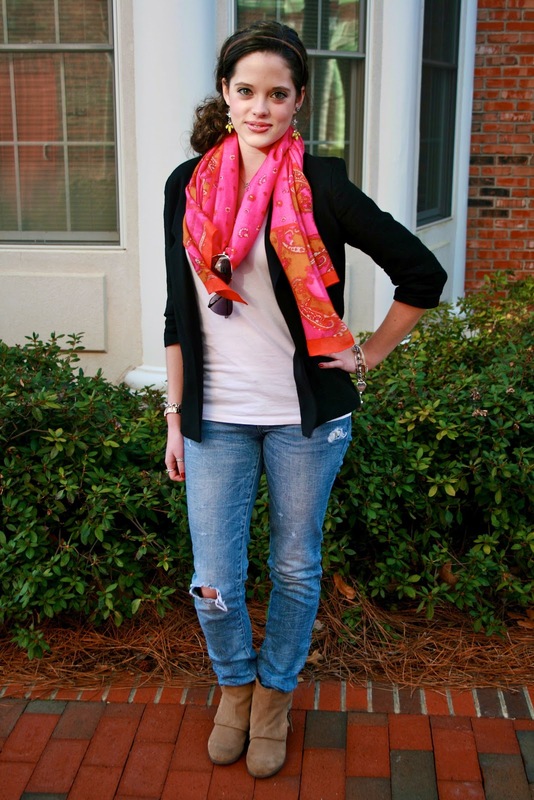 cute look, we love the scarf! I really love your post, specially your pants, amazing eyes!! 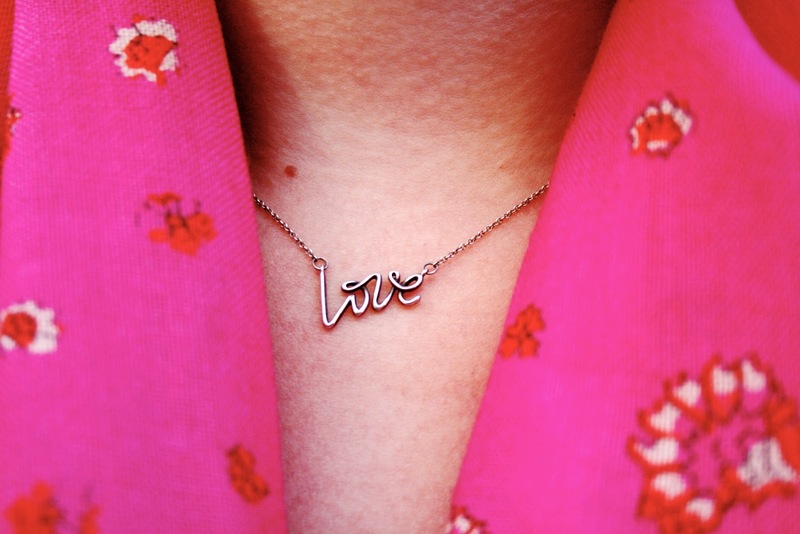 Your love necklace, just a simple detail but so cute! 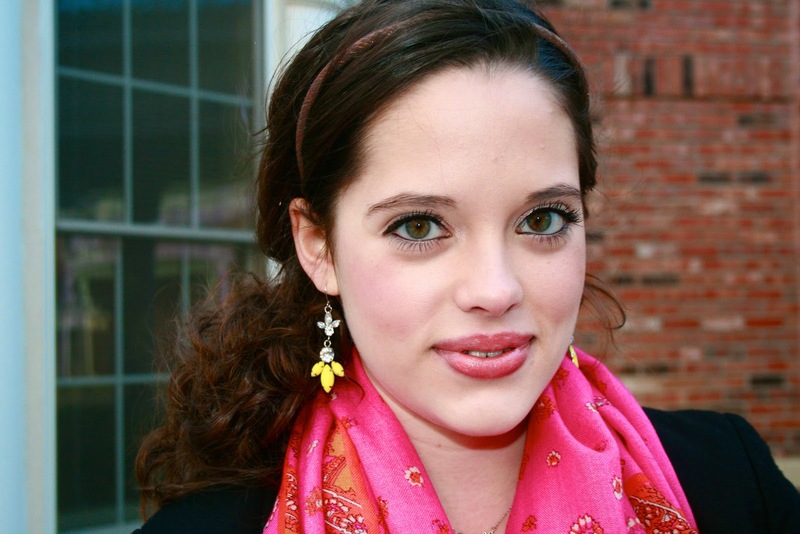 i love your scarf, jewelry and lipstick the best!! Kat! 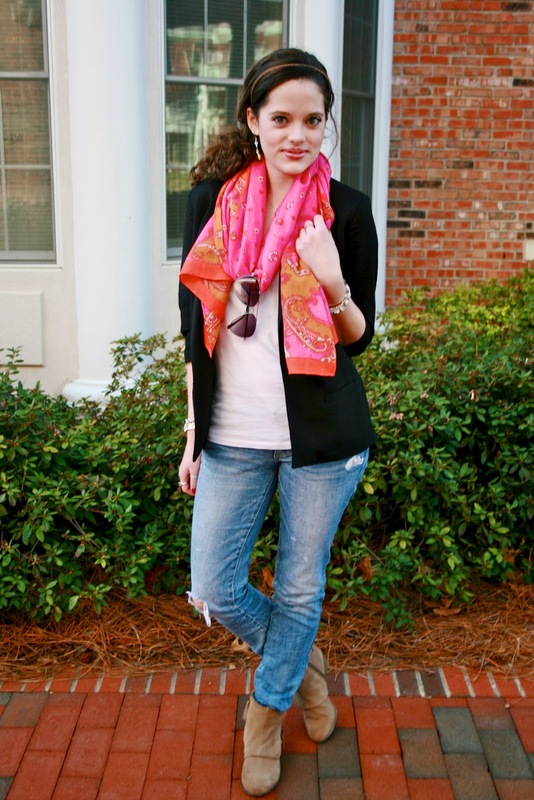 I love your scarf with the paisley print! So pretty girl! Looks great with the black blazer and skinny jeans:)! Thank you very much for visiting and following my blog. I find yours so inspiring that's why i'm following you now! Lots of love and have a nice day dear!! loved it nice blog ! Maybe we follow each other on GFC , Bloglovin' , facebook .. let me know i'llbe so glad ! You look so cute! 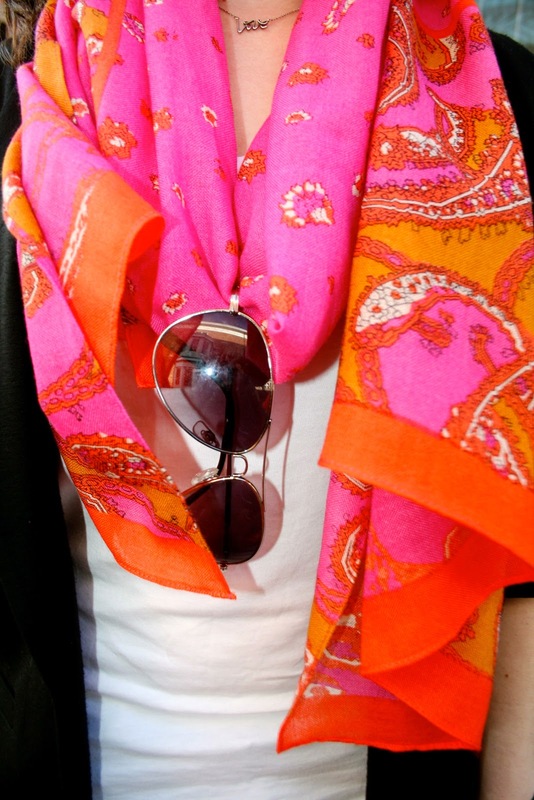 I love how you draped your sunglasses over your scarf. Clever. Love this look! I am following you on Google Friend Connect. Is there any other social site you would like to follow ? gorgeous look! 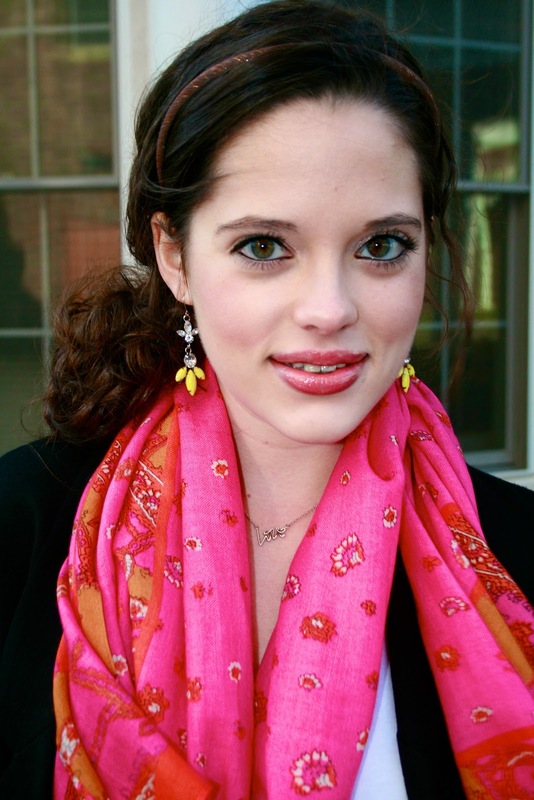 love the scarf:) thank you so much for following dear:) I am now following you too! keep in touch darling! by the way, I have a new post now and would love to know your opinion on it!! 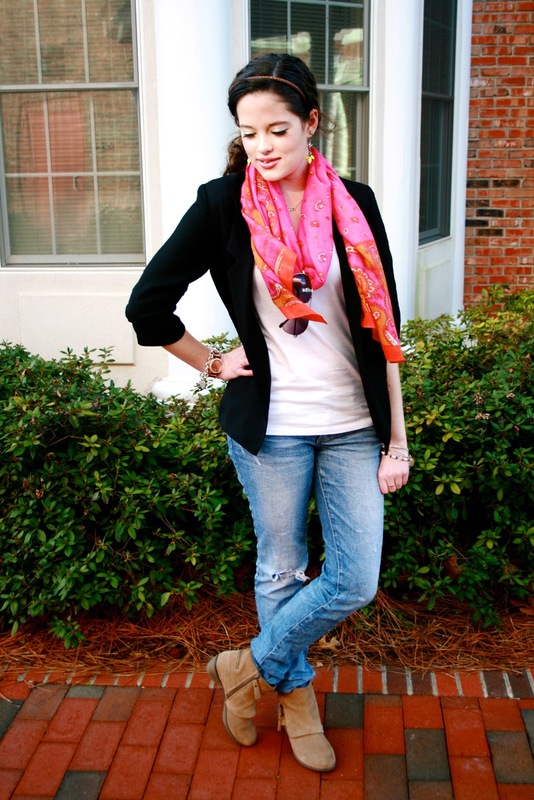 the scarf was the perfect addition to this outfit! love those jeans too! you have beautiful eyes ! You look so pretty. Love the scarf detail.